Our evening skies have been especially lovely recently due to wildfire smoke coming down from Canada. It’s pretty ironic that we’d get so much beauty from such destructive forces. We are lucky to live in a place that doesn’t have too much light pollution. 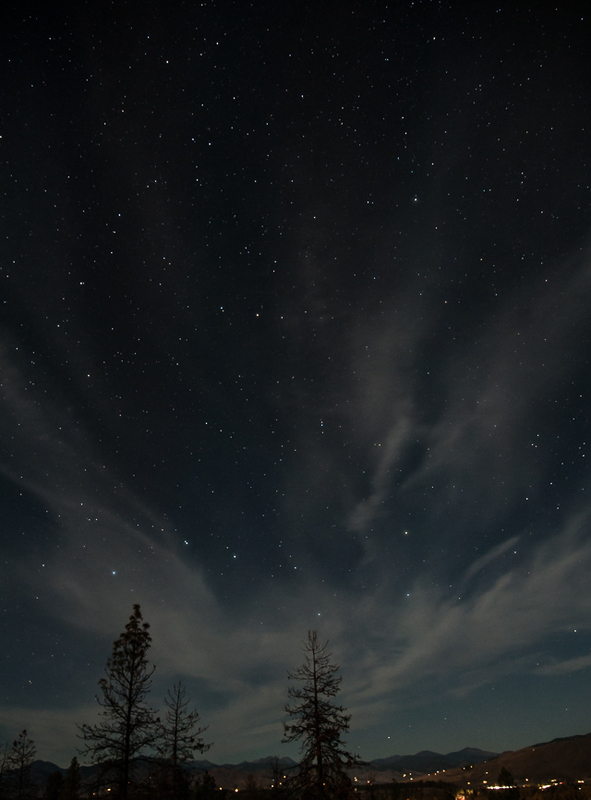 Can you see Cassiopeia and the Great-horned Owl? Last night the clouds were amazing and the light was other worldly. Today, the smoke is so thick, I cannot see the mountains. Last week I made a few attempts to stay up late or set an alarm in hopes of seeing the aurora borealis but my timing was all off. I never did see the colors and pillars of light that others were seeing. Big sigh. 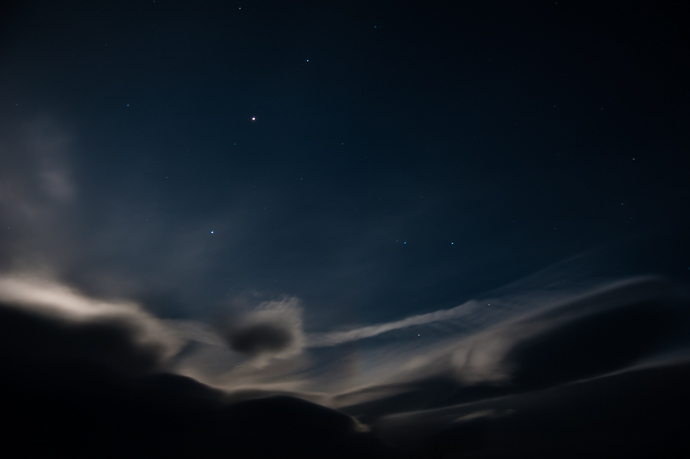 I did see some lovely night skies though. We are lucky to be able to see lots of stars since we don’t have a terrible amount of light pollution. 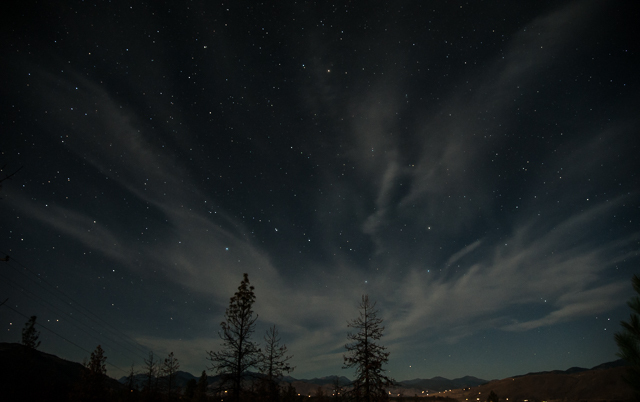 People here value that particular quality of life in the Methow and work hard to encourage others to cut down on night lighting or shroud their lights in such a way that the ground is lit but the light is not spread far and wide ruining others’ night time experiences. For more information on this issue, see the International Dark Sky Association website. This is a good time to see Venus and Jupiter in the early evening sky. From our vantage point they will come close to converging in a few days. Venus and Jupiter appear to be getting closer to each evening. Sadly on the night of the 14th, clouds obscured the lunar eclipse at my house. I had hoped to watch and make some nice images. Oh well. 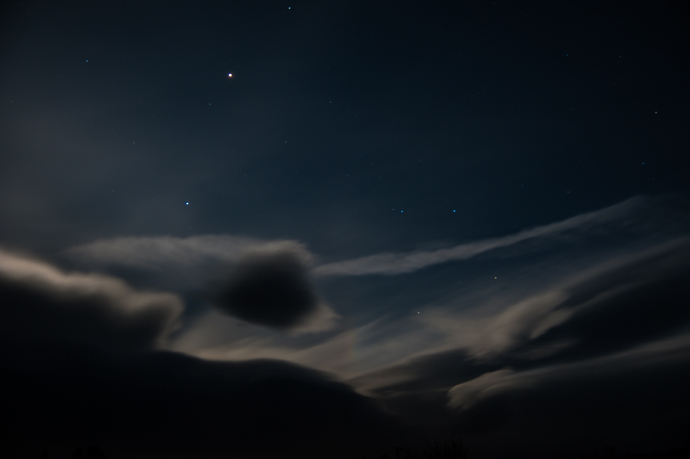 Last night I was out with the dogs and noticed that clouds were once again obscuring the moon but the moonlight was shining behind them, highlighting the edges and the sky that was not cloud-covered. Stars and planets adorned the dark sky too. The tripod was still handy from the night before so I went out in the cold to see what I could get. 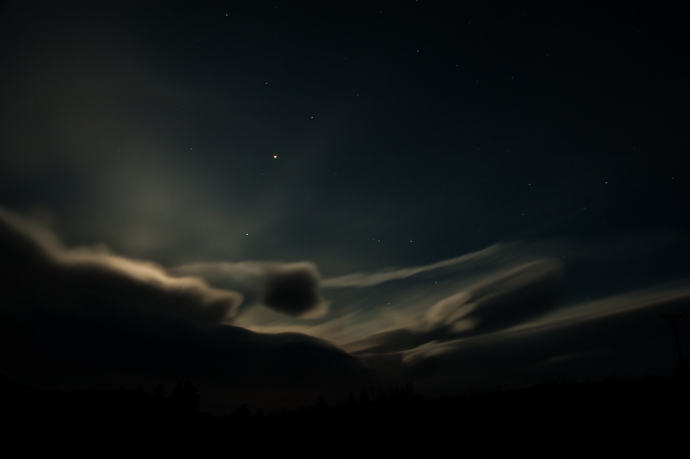 These images represent the changing light as the clouds, the moon and the earth moved. I am lucky to live in a place where light pollution has not yet overcome our night skies and seeing the stars and planets is a normal occurrence.